For installation of a chimney in a cathedral or pitched ceiling such as standard A-frame construction. 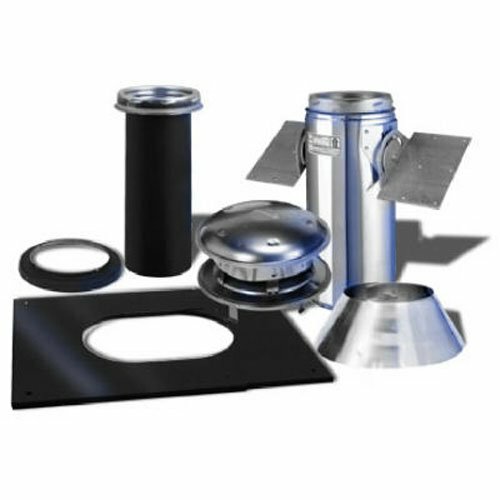 The pitched ceiling support kit provides all necessary parts for a complete installation with the exception of the required Insulated pipe lengths and adjustable flashing. Contains: round top, storm collar, roof support package, adjustable ceiling plate, finish collar, and a smoke pipe adapter with coupler. Dura Plus Chimney is the metal chimney that does the three things a firesafe chimney must do Stay cool on the outside, provide a hot draft on the inside, with a firesafe design that protects both the chimney and building. Use for manufactured home through the roof installations. 6" DuraPlus Manufactured Or Mobile Home Kit Can be used for cathedral ceilings Use for manufactured home through the roof installations. 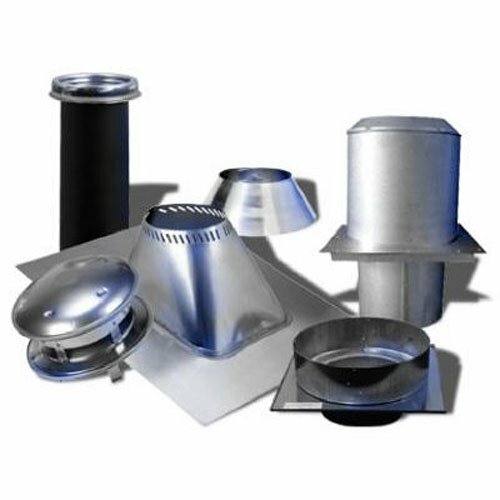 Includes: 1 each DVL/durablack adapter 1 each 24" square ceiling support box with trim 1 each adjustable flashing 0/12 6/12 1 each chimney cap 1 each storm collar 2 each duraplus galvanized chimney pipes. AIRJET 6SOTK Through Wall Chimney Kit, 6"
6, through the wall outside wall chimney kit, includes round Termination cap, matte black finish adjustable wall thimble, tee, tee support, weather shield, matte black finish face plate & 3 wall bands, UL listed, fha & Va accepted, use with air jet triple wall class a 2100 degree chimney systems. DuraPlus Chimney is the metal chimney that does the 3 things a firesafe chimney must do: stay cool on the outside, provide a hot draft on the inside, with a firesafe design that protects both the chimney and building. It is designed for appliances that are tested and listed for use with a 2100deg F HT chimney system such as wood stoves, fireplaces, furnaces, boilers, stoves, ranges, water heaters or appliances fueled by wood, oil, coal or gas. This kit is the perfect solution for applications when you must penetrate the wall. Add DuraPlus chimney to the kit for a full system. U.S.A. Diameter (in. ): 6. 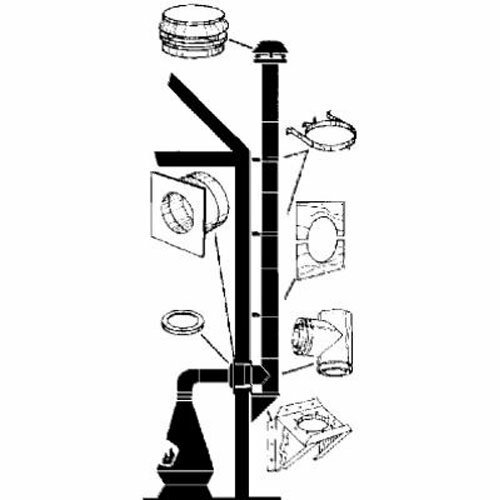 6" Includes1 each DVL/durablack chimney adapter 1 each snap lock adapter 1 each 9" galvanized duraplus chimney pipe 1 each wall thimble 1 each tee with cap 2 each adjustable wall straps 1 each tee support bracket 1 each chimney cap Use for through the wall installations Made in usa. 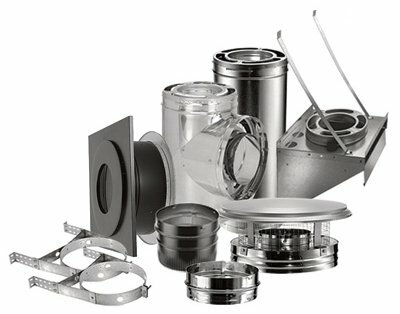 8" inch, 8T-PCK, Pitched Ceiling Kit. For installation of a chimney in a cathedral or pitched ceiling, such as standard A-frame construction. Provides all necessary parts for a complete installation with the exception of the required insulated pipe lengths and an adjustable flashing. Includes round top, storm collar, roof support package, finishing collar and smoke pipe adapter with coupler and an adjustable pitched ceiling plate. 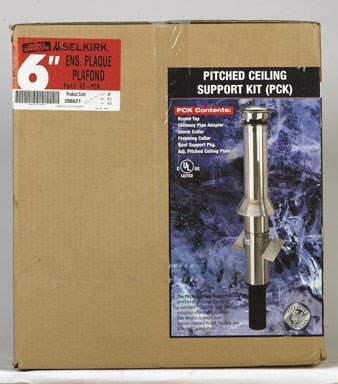 Want more Pitched Ceiling Support Kit similar ideas? Try to explore these searches: Arched Pull Handle, Duet Speaker System, and Nike Pro Winter Tight.